Simple black and white outfit for Wednesday. Really starting to struggle with finding nice things to wear to work now in the final few weeks of pregnancy. I'm quite looking forward to finishing up soon, and being a lot more casual with what I wear. Based on some previous pregnancies in the office, I know the levels of dress code I can drop to, but I want to try and look as professional as possible despite my limited choices. This was comfortable all day though, and was good to wear to our parenting class after work as well. Thought that the little bit of print mixing with the leopard scarf and tartan skirt worked well due to the similar colours - what do you think? Last worn: grey and pink leopard print scarf, Jeanswest black shirt, Asos maternity pencil skirt, two tone flats, Marc By Marc Jacobs Fran. More print mixing, and I got to wear my maternity tights! I purchased these tights a couple of months ago when we had a little bit of a cold snap, figuring they would be essentials for the pregnancy. Just wearing them now at 36 weeks, so not as essential as I thought! They were only $8 from Target so I'm not feeling too bad about the purchase. Picked a pretty dress to wear to work and after today, as we had a birthday dinner for my sister in the evening. The tights kept me warm and the dress was suitable for work and dinner, which saved me trying to find a second outfit to wear for the evening, hehe! 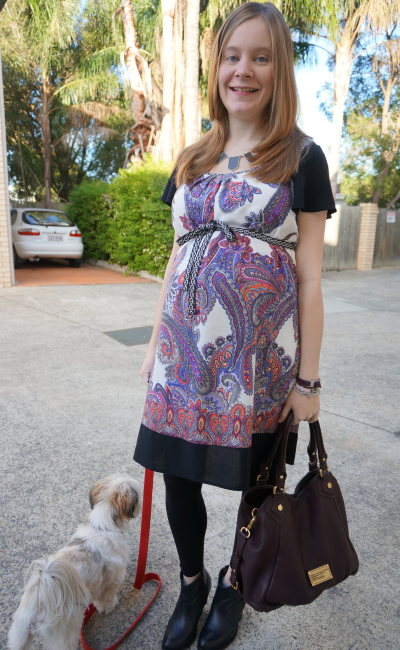 I bought this dress in the Jeanswest sale as I loved the paisley print and the subtle print mixing, and guessed it would have no problems accommodating the third trimester baby bump despite being non-maternity. 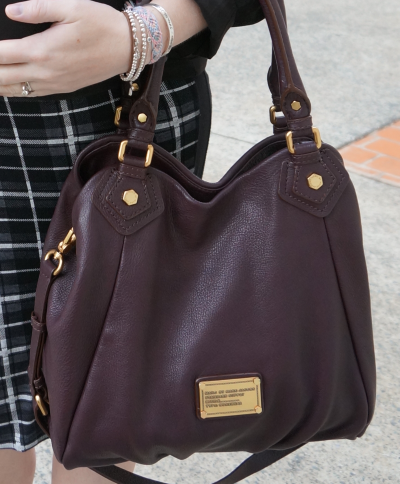 Yep, another Marc by Marc Jacobs bag! Last worn: Asos ankle boots, Marc by Marc Jacobs Fran (see above). First time I've worn the dress as it's a new purchase. Linking up with Three-Fer Thursday, Tres-Chic Fashion Thursday, What I Wore to Work, Fashion Item Friday, Currently Loving, Friday's Fab Favourites, Casual Friday Linkup today. I love your boots and tights combo! I am a boot girl at heart. Such a fun new bag! That color is classic. The checked skirt is sooo cute! I love your pattern-mixing, and you are gorgeous in that dress! I don't think I believe you about not having shoes for Shoe Shine - both pairs you're wearing are lovely! Haha thank you Sheila! :) I'm at that swollen stage where shoes are pain though, looking forward to finishing work and being free of the requirement to wear shoes! That last outfit looks so fabulous on you! i need that leopard scarf, so cute! loving your whole second outfit. it's finally boots weather over there!! congrats on the new MJ bag too, the color is fantastic. Not long to go now!!! Awwwww. Once again....looking darling as always in the dress and skirt! I love that tartan skirt - it almost looks like a windowpane print, which I love! Glad to hear you've deiced not to throw style out the window just because you are pregnant. Love your printed dress, paisley is one of my favorites! haha, I'm sure by the end of the pregnancy it will be difficult to avoid oversized tees and trackie dacks! :) It's easy to dress up when I have to for work. love your bag!!! so so cute!!! that first outfit is super slick! love it! and haha - another mbmj bag? ;) such a gorgeous colour, i can't blame you! i've been eyeing the same bag in black! I can't believe you are almost there! Great new dress and love that you can use it afterwards too. And I am a big fan of Marc by Marc Jacobs too - love your new purse! Love the boots Mica! And you're looking beautiful than ever, stay healthy. 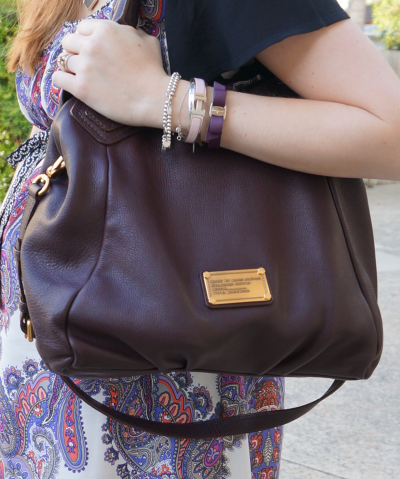 i love the paisley print dress and what a beautiful Marc Jacobs bag! You look lovely! Your pregnancy seems to be flying buy, I love the scarf in the first outfit and the pattern on the second is lovely. Love that skirt and dress! Very pretty on you Mica. Oooh, great print mixing in that first outfit! I'd never think to pair leopard and plaid together, but it totally works! you can never go wrong with Marc by Marc Jacobs! & you are a seriously fabulously dressed mom-to-be! and i loove the print mixing! looks so gorgeous together! The scarf, maroon bag and paisley dress are all so gorgeous. Love how you styled the dress too. By the time next year you will be celebrating Mother's Day as a New Mom. How exciting, Micca! !